‘Sleeping Amongst Wolves’ is a new e-Book by Andoni Canela. Earlier in the year we made a review of Andoni Canela’s iPad App – ‘AQUILA – The Spanish Imperial Eagle’. He has since expanded this series to include the Spanish Brown Bear – ‘Urus’ with many photos taken in Asturias. 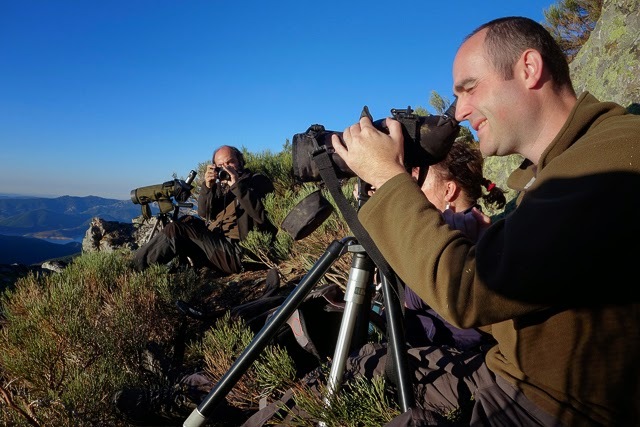 Now, as part of his around the world trip, photographing some of the most emblematic wildlife from 7 continents, he has released a new e-Book ‘Sleeping Amongst Wolves – In search of the Iberian Wolf’ (Durmiendo con lobos – En busca del lobo ibérico). Video trailer above. Discover the Iberian Wolf in this spectacular 164-page multi-touch e-Book. More than 140 previously un-published photographs, with videos and audio recordings created by Andoni Canela. Foreword by wolf specialist Juan Carlos Blanco. Nature photographer Andoni Canela publishes a new book about the Iberian wolf in the mountains of northern Spain. The stunning images, accompanied by audio and video, allow us to see at close quarters, the Iberian wolf living in the wild. You can hear them howling under the night sky, observe wolf pack behaviour, witness a mother feeding her young, watch the cubs playing and admire the wolves moving through the winter snow. In addition, through first-person accounts of Andoni Canela, we discover the secrets of combining professional nature photography with the demands of family life. We also watch as his children (nine and three years old) venture into wild nature and discover the wolf for the first time at their father’s side. ‘Photographing free-living wolves is reserved for the best. Nobody has managed to portray the wild expression of the wolf caught in rocky scree, the games and fights of the pups, (…) the excitement of members from the pack…’ writes Juan Carlos Blanco, biologist and member of the Wolf Specialist of IUCN, in the book’s foreword. For full disclosure I am involved in the running of the Andoni’s website – www.lookingforthewild.com as well the English translations. But I have no hesitation in recommending this fascinating personal account, with an interesting foreword by wolf specialist Juan Carlos Blanco and, of course, spectacular images of wolves in the wild. The e-Book is current available for the iPad in both Spanish and English – click here. 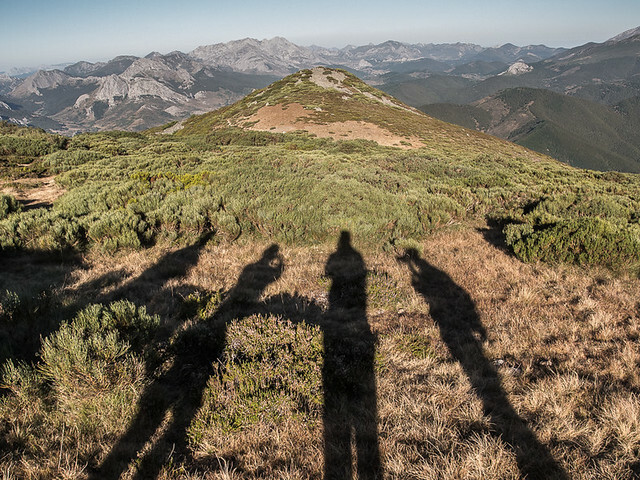 We made our own visit to Riaño (on the edge of the Picos de Europa National Park) at the beginning of September. Well accompanied by Andoni and Juan Carlos, and we encountered wolves on 3 separate occasions. On the first evening, whilst waiting hidden among the mountain scrub of heather and broom we heard wolves howling, albeit faintly. It was a great start and besides discovering their tracks and kills, our first ‘live’ wolf encounter in Spain. The next morning, we left our lodgings very early and it was still dark after as we left the 4 x 4 and climbed towards the chosen viewpoint. 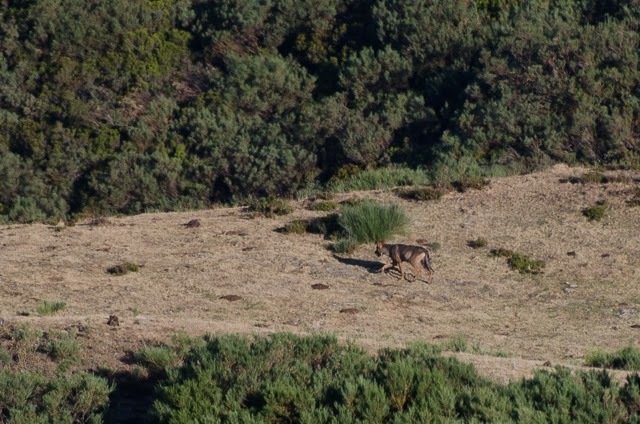 This was to be the moment – our first wild wolf sighting in Spain. And we were very lucky. Not just one but eventually 6 wolves made an appearance over the next few hours. It was too greater a distance for any photos with my modest 70-300mm lens but we had great views with binoculars and telescope. On the third morning, we went out alone, to an area we’ve walked in many times before but never looking for wolves. This time it was later, well passed sunrise as we watched a herd of red deer (a stag and 7-8 hinds). They looked nervous and moved at higher ground, the stag hanging back and stopping to watch. We assumed it was our presence that disturbed them, but then a lone wolf appeared below, calming walking away from our position. Unknowingly we had been observing the wolf and deer carrying out their own rituals. Surely, watching a wolf hunting a deer would have been too much to expect on only our third outing of that trip! After leaving our vehicle in the dark, we hiked to this lookout and waited for sunrise. A short rest and a moment to contemplate the magnificent views of Riaño after the morning’s excitement. The final morning and another sighting. A single wolf heading out of sight for the daylight hours. You’re a lucky man. I’ve lived in wolf country for 55 years and have yet to see one in the wild. I’ve never even heard one howl; only bark. (still went right through me). Our coyotes are nearly as big and bushy as the real thing, but it doesn’t count. My husband has spent even more time in the bush than I have and he’s only seen one. What a wonderful experience you’ve had! Hi Christine. Yes, we were very lucky. I guess wolves have learnt to survive by avoiding people, it’s not easy. Perhaps the valleys are smaller here, everything more compact, so easier to spot them. We are planning to visit Canada in 2015. A photo of a Canadian wolf would be nice! Happy New Year. You are indeed a very lucky man John. I hope you enjoy your trip to Canada next year and manage to get some great photos. Unlike a lot of the knuckle dragging morons ( north and south of the US/Canadian border, as well as in Spain ) that think it’s fun to slaughter these beautiful, intelligent creatures in any way they can, at least you’ll only be ‘shooting’ the wolves with a camera. By the way, I found your site via the Spain Buddy blog of the month award.